Bio: Carol Dallas, PSA, PSC, has a B.A. in Art from the University of Wyoming and an M.A. from the University of Colorado at Denver. She is an art teacher in Aurora Public Schools in Colorado. She works mainly in watercolor and soft pastel. Media: watercolor and soft pastel. Subjects: Portraits. A few still life paintings too. 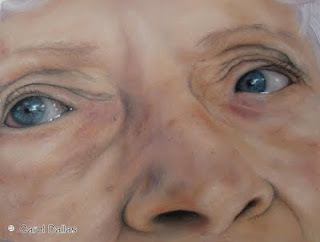 Style: Remarkable portraits in close up. Navigation: Main menu for artist and artist’s daughter. Gallery: Thumbnail gallery leads to enlargements. Image view: Enlargements give info on size and medium. May be downloaded to 600x400 40 KB images.